For those of you who have missed Cheesecake for it's thick, creamy filling, rich and complex flavors...today brings good news. 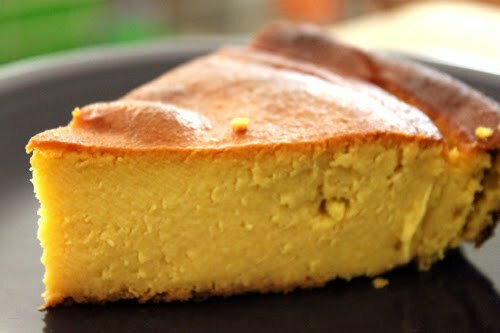 With my new recipe for Orange Almond Flour Cheesecake, anyone can enjoy this sinfully delicious treat. And with such simplistic natural ingredients, I may even enjoy some with tea for breakfast! 2 cups almond flour or almond meal (I used Bob Red Mills Almond Meal, but a fine almond flour would be even better if you don't have a high power blender/food processor). Wash your organic oranges and boil them in water for 30 minutes. The skins should be softened. If you have a variety of orange that is very thick skinned, you may boil it longer until the outer skin softens enough to puncture easily with your hands. Chop the M-L oranges into fourths and blend until pureed. I use a Vita Mix for this, and the oranges become very creamy with this machine. Add eggs, honey, almond meal/flour, optional salt and blend until all is smooth and pureed. Pour into a round 9" pie dish and bake at 375 degrees for 35-45 minutes, or until top begins to golden and center is done. This delightful dessert is a happy mix of orange, egg, and almond, which gives it a great boost of protein while minimizing the carbohydrates and sugars found in most desserts. While this is delightful on it's own, consider adding 1/4 - 1/2 cup coconut milk to the mix for a creamier center, or topping with Rachel Mastez's recipe for Coconut Whipped Cream.